Darren Ferguson is backing his side to spoil Wigan's party by beating them at the Keepmoat this afternoon. Not much rides on the game for Rovers but if they beat Wigan and Blackburn win elsewhere then the title will be Blackburn's. Ferguson said: "It has been spoken about [how sick they are of teams celebrating on their turf]. Unfortunately, we've ran out of gas a bit - I feel some of the players have played too many games, similar to last season. "The energy is there to a degree but there are people who have played too many games and if the injuries hadn't occurred I could have perhaps would've mixed my squad around a little bit more. "It's going to be a tough game but also a good game for us because a lot of people are probably expecting us to get nothing and I think it's important that we try to finish well." Captain James Coppinger will be a doubt for the final match after being sidelined for the last two games with a 'niggle'. Long-term absentee Danny Andrew could return with Ferguson saying the 27-year-old could play around 15-20-minutes on the last day of the season. Wigan come to the Keepmoat with the best away form in the league, collecting 48 points from 22 games played away from the DW Stadium - Rovers' home form is average with them collecting 30 from 22 games. Paul Cook's side is undefeated in their last seven games - with their last defeat coming away at Portsmouth. Ferguson's team, on the other hand, have only won two games out of eight towards the final part of the season. Rovers got played off the park in the reverse fixture, with the Latics coming out with three goals to the good on that occasion. 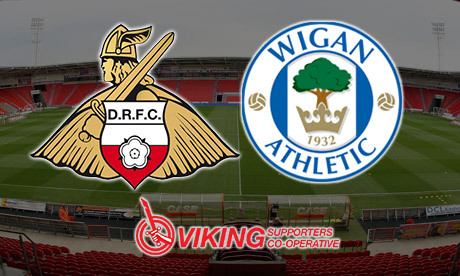 The last time Wigan came to Doncaster they lost 3-1, after going a goal up through Will Grigg in the first-half but being shunted by two Andy Butler goals and an Andy Williams penalty - this was also the same season Wigan were aiming for the title too.